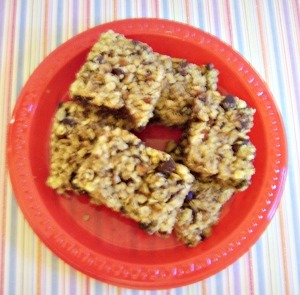 If you like granola bars, you’ll be happy to know that you can make your own without much effort. This recipe uses basic ingredients that stir together easily and only takes about 15 minutes to bake. You can play around with this recipe too and add other flavored chips or additions like raisins or dried cranberries. I like to eat these bars, along with some fruit, for a quick breakfast. They’re much more filling than cold cereal and taste better too! In a large bowl, mix together the oats and the brown sugar. Then mix in the nuts, chocolate chips, and the sunflower kernels. Add the honey, melted butter and vanilla and stir well to combine. Press into a greased 11×7 pan. Bake at 350 degrees for 15 to 20 minutes. Cool and cut into squares.